Unorthodox-Jew A Critical View of Orthodox Judaism: "Only a few months earlier, Reb Shraga Feivel, the great architect of Torah education in America, had placed a full-page ad in the Morgen Journal, the most widely read Yiddish newspaper of its day. The anonymous ad excoriated American Jews for their inaction during the Holocaust and called upon them to rebuild the Torah institutions and the vibrant Torah world that had been lost." 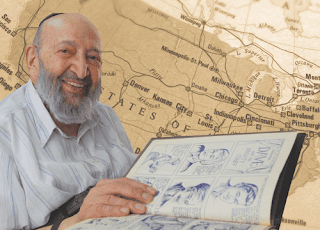 "Only a few months earlier, Reb Shraga Feivel, the great architect of Torah education in America, had placed a full-page ad in the Morgen Journal, the most widely read Yiddish newspaper of its day. The anonymous ad excoriated American Jews for their inaction during the Holocaust and called upon them to rebuild the Torah institutions and the vibrant Torah world that had been lost." Several years ago, Rabbi Binyomin (Bernard) Goldenberg passed away in Yerushalayim, having lived the last three decades of his life in Eretz Yisrael. But over his long career with Torah Umesorah, he played a vital role in radically reshaping the spiritual landscape of Judaism in America. In an exclusive interview with Mishpacha only months before his passing, Rabbi Goldenberg shared some of his recollections, opening a rare window into the history of American Jewry in the early twentieth century. “Don’t you know what he says?” the gadol replied. “Yirmiyahu says: Zacharti lach chesed ne’urayich, ahavas kelulosayich, lechtaich acharai ba’midbar, b’eretz lo zeruah. We read the words b’eretz lo zeruah as ‘a land that has not been sown’ — but that phrase can also be taken to mean a land that has been sown with lo, with ‘no,’ a land where negativity is embedded everywhere. And how does the story end? Currently, there is only a Lubavitch day school in St. Paul... Prior to that, I can find no record of a Jewish day school in St. Paul other than those founded by the Conservative and Reform Jewish congregations of St. Paul. I'm not certain...but I believe when Rabbi Goldenberg left Minnesota, the school struggled to find a suitable replacement in a very difficult town.